Next…Bring Back the Ostrich Plumes! Pope Benedict XVI even during the annual summer holiday seems to always irk some activists. Now the latest issue concerns the animal rights of the mustela erminea more commonly called the stoat or short-tailed weasel. The winter fur of this small mammal has traditionally been used in the attire for monarchs, judges and civil officials throughout most of history from the Roman era until the present day. 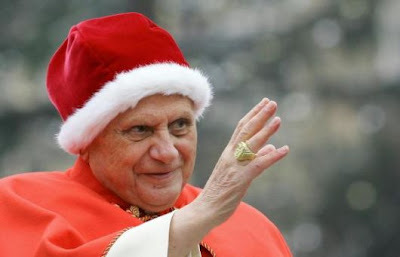 In the case of Benedict XVI, his winter mozetta and the Easter mozetta (recently revived after a 40-year hiatus) are under attack, as well as the camauro, which is an ermine trimmed hat worn in colder months. The camauro also has not been out of the papal closet since John XXIII. Benedict has also restored its usage during the Roman winters! Italian animal rights activists have appealed to the Holy Fatherâ€™s feline affections and asked him to no longer wear the fur of the prolific stoat, which populates most of Northern Europe and the Northern reaches of the Americas. The activists consider the use of the fur as cruelty to the diminutive animal and ask that fur no longer be used to embellish papal garments. Traditionally the fur taken from this animal is used to accent ceremonial garments from all aspects of nobility and courtly life. The snow-white fur that the animal adapts during the winter season is traditionally considered as a symbol of purity. 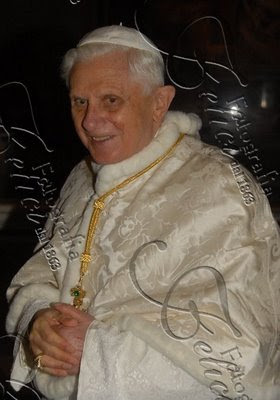 Judges in European courts have worn the fur for centuries as a sign of their objective purity in terms of the administration of justice, monarchs have worn it to symbolize their Divine right of monarchial succession, and Popes have worn it to indicate the Churchâ€™s ongoing mission to bring about purity to mankind with eternal salvation. To set the record straight, the animal is not endangered anywhere in the world. Use of the animalâ€™s soft and snow-white fur does not present an ecological or environmental catastrophe in the making. The inclination to appeal to the Popeâ€™s kindly disposition towards felines doe not offer a legitimate or logical argument towards prohibiting the Pope to wear the ermine trim on his garments. Most importantly, many issues that are more serious need the attention of the Holy Father besides the disposition of a few furs from an animal that is not endangered, nor on the verge of extinction. The Holy Father has consistently shown an appreciation for the environment and the potential dangers of global warming. While he has not publically state his animal rights stance, I am quite sure Benedict has no conspiratorial campaign against the short-tailed weasel that has such a fashionable winter pelt. The papal wardrobe consists of pieces that have also been handed down from his predecessors. Perhaps, the mozetta that the Pope is wearing is part of a previous Popeâ€™s collection of ceremonial vestments. Is it really necessary for the Pope to issue a disclaimer that; â€œNo animals were harmed in the making of this garment!â€ If indeed this is the case, then there also needs to be a disclaimer attached to every product that contains natural silk, which also destroys the silk worm in the manufacturing process. While modern individuals in some cases discourage the use of animal furs and hides in the making of clothing and other accessories, this does not seem to be a legitimate example that requires a papal response. If indeed there was an exploitation of the stoat that endangered its very survival, then perhaps a discussion is warranted. Viva il Papa Benedict XVI! Ad multos annos! 1 user commented in " Next…Bring Back the Ostrich Plumes! " It is very sad that the pope has decided to bring back the trappings of a monarch by waering ermine and other ridiculously dated outfits. He is the successor of Peter. He should not demean this great office by taking on the style of a king. I hope many of you have read “Common Sense” by Thomas Paine in High School or in college. This was the main writing that helped bring on the American Revolution. Paine made a great point. The first king and all kings were nothing else than than the chief ruffians of gangs that terrorized and dominated the poor local people. They then took on all these silly trappings of special dress and furs (such as ermine) to put themselves over the common people that they are using for their own gain. The pope, by prancing around in kingly outfits is especially telling the world he is part of this gangster class. Jesus certainly does not approve Read Matthew. Jesus is pretty clear he detests these these shows.